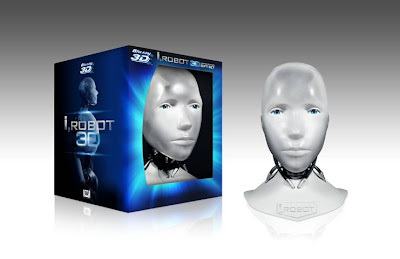 Twentieth Century Fox Home Entertainment announced today that I, ROBOT will be getting the Blu-ray 3D treatment and will be available at retailers nationwide on October 23, 2012. But for fans making the annual trek to San Diego for Comic-Con, Fox has created something special for you - a Limited Edition Collectible I, ROBOT Head, inspired by the film and jam-packed with goodies for robots and humans alike. The limited run of 250 serialized I, ROBOT heads is available for pre-order only at Fox booth #4313 for a special price of $99.99 and includes the all-new revolutionary 3D Blu-ray, a DVD version of the film and a bonus DVD disc chock full of extras.